I figured I'd do a post on the progress we've made so far on the house. I am a home renovation addict so maybe it's just me who adores this kind of stuff, but I've had some family and friends ask for more pictures so here they are! When we bought the house this is how the main living area looked. 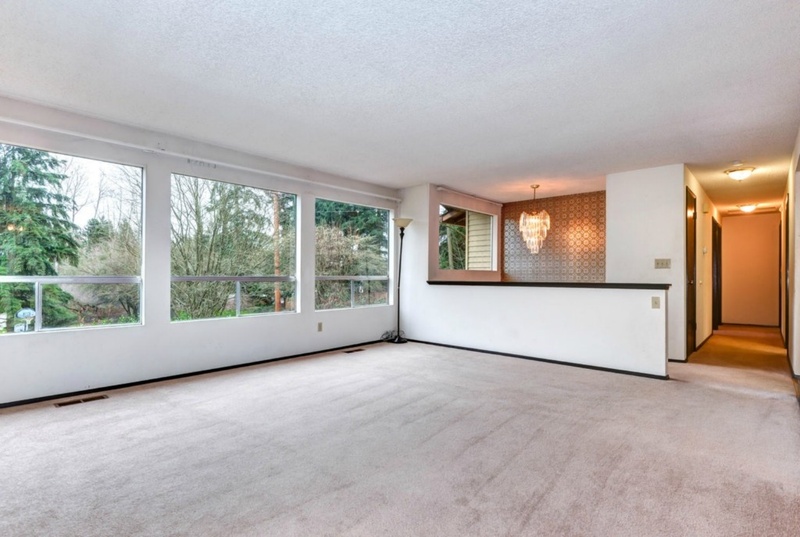 There's popcorn ceiling, 70's wallpaper in the entry (you can see a close up here), the original single-pane windows and really groovy window treatments. The carpet is old but liveable until we replace it with wood. All of the trim and doors are black, which drives me crazy but it'll make for a really fun "after" when we replace it with crisp, clean white mill work. 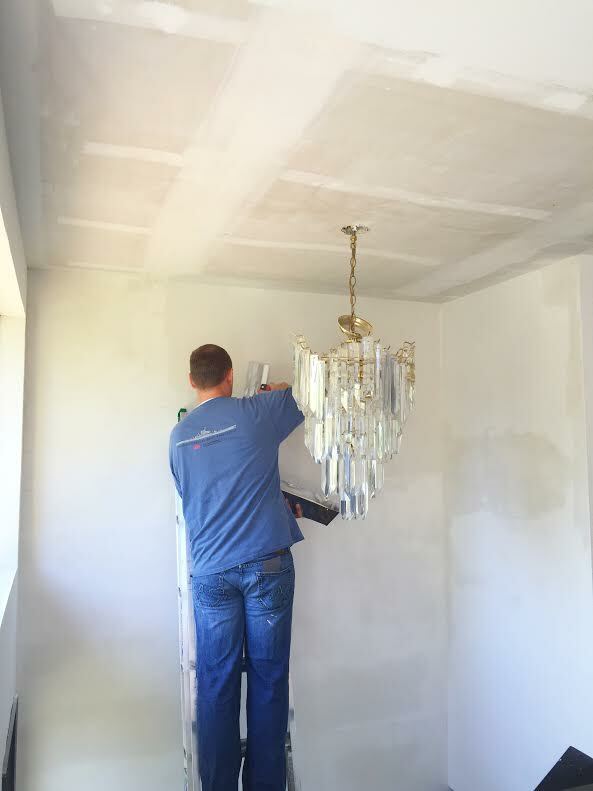 David spent hours scraping off the popcorn ceiling and then he and my brother, Stephen, spent another several hours skim coating the walls so they would be smooth. It wasn't necessary but it was something that I really wanted done and David is sweet and did it for me. This is how it looked a few days before we moved in. Eeee! It was such a mess. We were scrambling to get it cleaned up enough to move in the basics. I realize it probably doesn't look that different from the picture above (except more messy) but if you could see the detail, you would understand that it does look better. I'm a firm believer that no amount of pretty decorations can cover up outdated or crummy details. 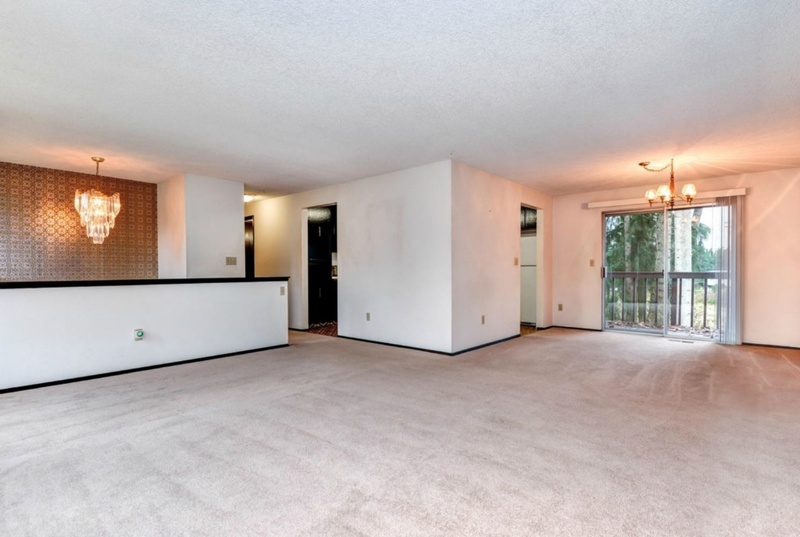 There was also a random wall separating the kitchen from the living room and dining room. It wasn't load bearing so David tore that down before we moved in. 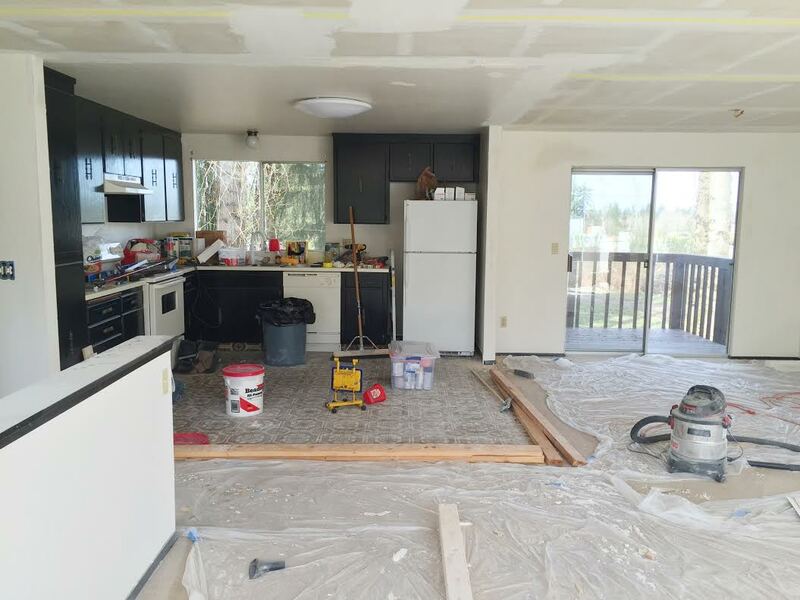 I'll post more about the kitchen later, but after David removed the wall, here's how it looked before we moved in and he was still using the kitchen as his work space. It's amazing how just taking down this wall really opened up the whole room and made it more bright in here. 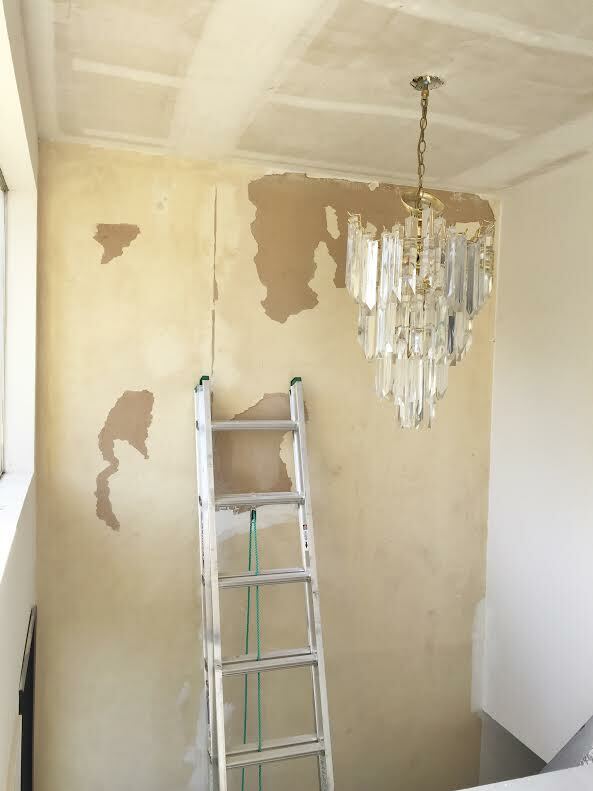 David has been working really hard on patching up the entry where he ripped off the old wallpaper and smoothing the walls to get it ready to paint. I've been spending nap times this week, cutting the corners and we're hoping it will finally be fresh and painted in the main living space by this weekend. Fingers crossed! This is the original fixture in the entry and I hated it with the old wallpaper but I think with some fresh paint and the other decor in, that I can live with it. It needs to be cleaned but once that's done, I bet it'll be shiny and pretty again. 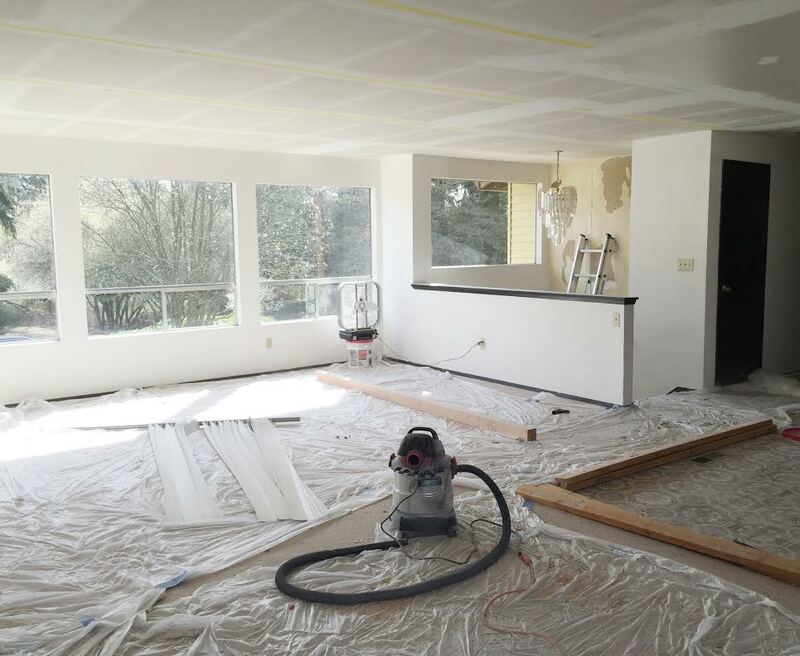 Fun to see your great home progress...every little bit is so exciting! Glad you got some time with your sweet Lela.